What a week for Unicorn hockey! 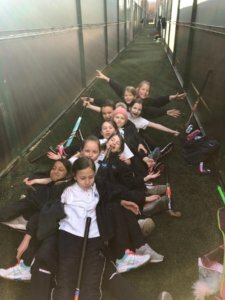 Our Year 4 girls competed in a hockey festival organised and run by Prospect House. The brief was simple: Think about the skills you have been practising, enjoy yourselves and if you win a game then that is a bonus. What we were not expecting, was for the girls to play so well that they won all three games! Every girl played with focus, commitment and worked well as a team; the level of play was high and enjoyable to watch – huge congratulations girls. Our Year 5 boys were also involved in a hockey festival this week. Motivated to win, all the boys were keen to showcase their skills. Before the games began we talked about our aims, formulated a plan and decided on a formation. The tactics were very simple, keep them out of our ‘D’ and move the ball quickly into their half. Not only did we not concede a goal, but the ball never entered our ‘D’ which meant they could not score. We won three of the four games and drew the last. Considering we have only had a few hockey sessions, all the boys looked like seasoned players – well done to all the boys too.